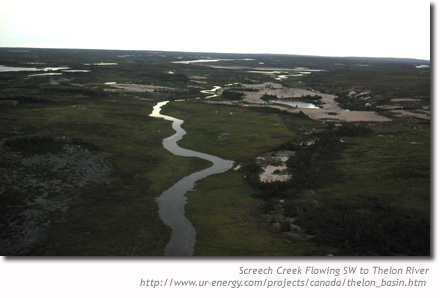 The Mackenzie Valley Environmental Review Board has reviewed the request of Ur-Energy for a Land Use Permit on an exploratory drilling program at Screech Lake in the Thelon Basin, NWT, and has recommended that the project not be approved. It is only the second time that the Review Board has not recommended a project. As reported in January, Ur-Energy initiated its second environmental assessment process in two years, the first (EA 0506-003) being abandoned by the company after strong community concerns at Lustel K’e and cost overruns projected by the company. The Review Board agreed to the second request (EA 0607-003), and held public hearings and reviewed written submissions in January to evaluate the environmental and cultural impact of the uranium exploration project. Its final report was released on May 07, 2007 (and can be download here). It acknowledges the unique cultural and ecological values of the Thelon River and Basin, and cites the spiritual significance of the area to Dene First Nations, wilderness values, economic disruption to ecotourism businesses, and the lack of a land use plan as primary concerns. In its own words: “The Review Board is of the view that although the proposed development is physically small, the potential cultural impacts are not” (pg. 1). The report now gets forwarded to the Minister of Indian and Northern Affairs for a final decision. Ur-energy indicates it intends to meet with the Minister and “will continue to pursue any and all approaches that will allow us to advance exploration on the project as soon as possible.” Urgent action is needed. Please write a letter to the current Minister of Indian Affairs and Northern Development, the Honourable Chuck Strahl, urging him to accept the recommendations of the of the Review Board. RE: EA 0607-003 (Mackenzie Valley Environmental Impact Review Board Report of Environmental Assessment and Reasons for Decision On Ur Energy Inc. Screech Lake Uranium Exploration Project). CBC: Review Board Rejects Proposal (May 09, 2007). Beverly and Qamanirjuaq Caribou Management Board: “Developer on key Beverly range blocked – for now” (July 2007). CBC: “Lutselk’e Dene learn about uranium mining” (Sept. 02, 2009). CBC: “Lutselk’e shocked by chief’s support of Ur-Energy exploration” (Sept. 03, 2009). Many thanks … I didn’t see the letter of acceptance yet. It’s important to note that Minister Stahl has tasked the Department of Indian and Northern Affairs to draft a “plan” by the end of November that “may allow development in some areas of the basin” (according to the CBC). I hope to post an update with further details in the next couple of days.